I used to purchase frozen waffles every other week or so when I grocery shopped as an alternative to cereal. I'm not horribly wide awake in the morning (especially when the kids were younger) and needed something they boys could cook for themselves. 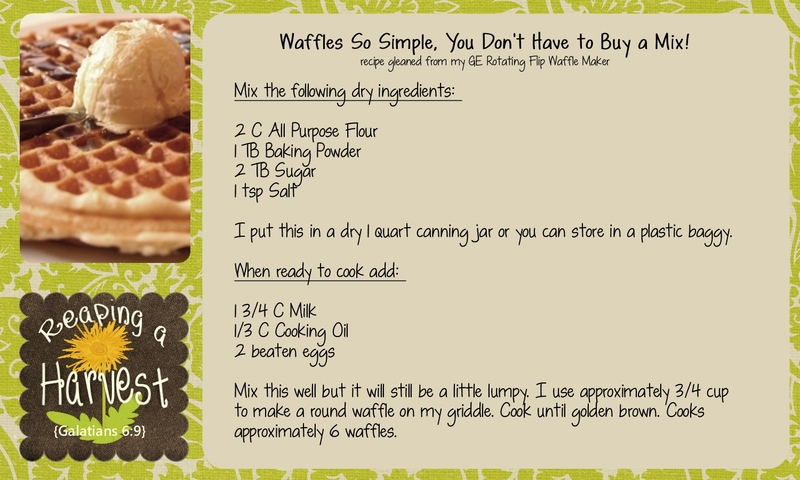 But soon they began inhaling waffles, so I cut them out of the budget, purchased a waffle maker for $20 and was super happy to find a simple waffle recipe that works great. These days, I usually make three batches, store them in glass canning jars and use them as needed for a quick alternative to pancakes, cereal and eggs. I'm hoping to create a similar recipe for quick-n-easy pancakes. But, if you already have one, wanna share?